While flicking through the in-flight magazine yesterday, I spotted a short article on the BBC Good Food Show which started today at Olympia. Celebrity guests included Heston Blumenthal and Nigella Lawson, two of my food heroes (for different reasons). I sallied forth to West Kensington and looked at the prices which were an order of magnitude higher than expected. What the heck...came all this way. Heston at 3 p.m. in the Cookery Experience theatre. Splendid. Nigella was appearing on Sunday. Drat. 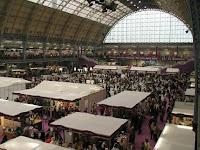 The exhibition hall was full of middle-age ladies sampling Britain's finest; cheese, ham, sausages, wine, beer, bread, hand-made super-expensive crisps, jam, pickle and liquorice (85p for a liquorice pipe?). A handful of men and a group of schoolboys took refuge in the Bose speaker display. There were cookery demonstrations and stands selling knife sharpeners and 'miracle choppers' which brought back memories of being dragged around the Ideal Home Exhibition as a small boy. I miss those tiny Hovis loaves. At 3 o'clock we entered the theatre for Heston's show which was based upon his Christmas programme from last year. And where did it start? Oman. We had to open envelopes which contained a gel strip of frankincense to eat while he was describing how gold, frankincense and myrrh were included in the first course. Tasted just like home. The show continued with more videos and whimsical stories enhanced by different smells, tastes and sounds which are an integral part of the Blumenthal eating experience. After the question and answer session, I was determined to get some advice on building an oven on the beach. I fought my way to the stage past people trying to take photos or shake the hand of the celebrity. After a quick chat, I came away with an email address to get detailed instructions. I made a few more circuits of the drink sections after the performance in an attempt to get rid of the taste of frankincense before heading back to the train. Not sure what all the other passengers were thinking, but I bet it wasn't about cooking a family-sized turkey on an Omani beach at Christmas. Wonder if I can get to the Fat Duck?